The Seal of MSU Naawan shows an encircled University System Seal (depicting the Maranaw "awang" in full sail and Maguindanao lamp with three rays whose flames rest on top of Maranao boat with the figure "1961"). Within the circle is the name "Mindanao State University at Naawan" and the year "1973". Meanwhile, the color of MSU Naawan is aqua-blue. 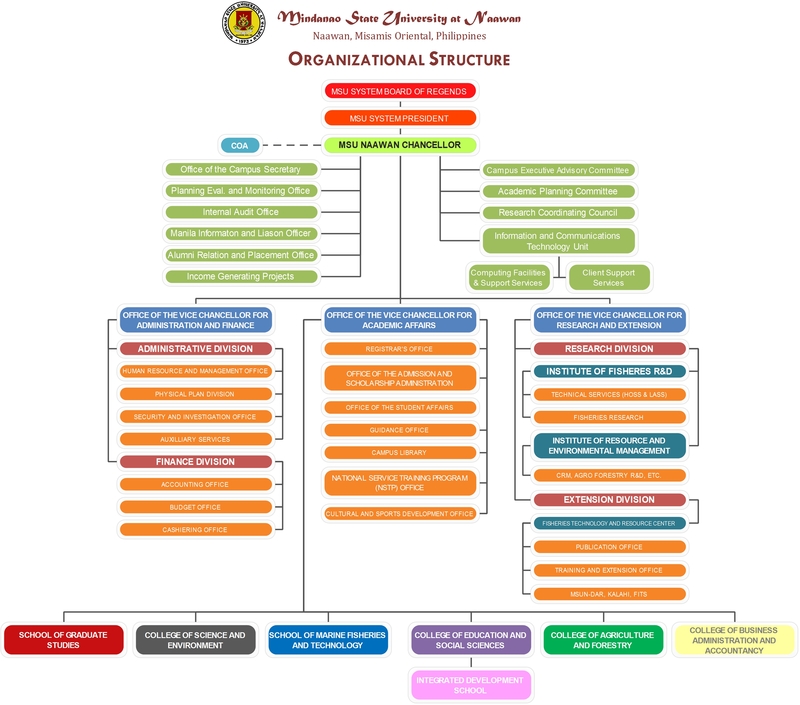 The diagram outlines the Mindanao State University at Naawan organization structure. Ang pook ng Mindanao Tinanglawa't pinalad, Nang ikaw'y isilang Na dakila ang hangad. Saan man naroroon ay Bigyang karangalan, Dakilang paaralan Pamantasang Mindanao. An Internationally recognized dynamic institution providing relevant, excellent, and quality education. To holistically develop God-fearing manpower resources committed to the core values of integrity, industry, respect to cultural diversity, and environmental sustainability for service excellence. Mindanao State University at Naawan was founded as a field laboratory of the MSU College of Fisheries under Dean Domiciano Kapili Villaluz in 1964. This field laboratory was intended to complement the MSU College of Fisheries program in freshwater aquaculture. Through the help of the Municipal government, a 15 hectare mangrove area in Naawan, Misamis Oriental was acquired for training students in the design and construction of brackishwater ponds for the culture of commercially important species of fish. At the same time, a handful of biologists under the leadership of Dean Villaluz was experimenting on the hatchery technique of producing the fry of Penaeus monodon Fabricius under laboratory conditions. In 1969, Dean D.K. Villaluz successful convinced the National Science Development Board (NSDB) of the very bright prospect of prawn culture in the country. This lead to the NSDB assistance of P37,000/year for three years to research project entitled "Reproduction, Larval Development and Cultivation of Sugpo, P. monodon Fab. Project." With this assistance, the research team under Dean D.K. Villaluz managed to construct a pilot laboratory. This first documented successful experiment on prawn culture inspired other institutions and private investors in recent years to put up, commercial hatcheries and provided bright prospect for a new dollar-earning aqua-culture industry. In 1971, the Sulu College of Technology and Oceanography was created by Republic Act No. 60 to develop the fishery potentials of Sulu nearby waters. In line with the objectives of RA 6060, the Institute of Fisheries Research and Development was organized purposely intensify research on fisheries with MSU-NSDB Marine Fisheries Laboratory at Naawan as its nucleus and with the SCTO Coastal Research Laboratory in Marawi City as its research arms on coastal and inland fisheries respectively. 1) Research; 2) Training and Extension; 3) Academic; 4) Conservation when Director Warlito M. Sanguila reorganized the administrative set-up of the Institute, the top level management of the institute consisted of the Director with three deputy-directors, namely: 1) Deputy-Director for Research, 2) Deputy-Director for Technology Transfer, and 3) Deputy-Director for Administration and Development. Expansion of the manpower and service coverage of the Institute demanded another reorganization in 1981. The streamlining was patterned closely to the organizational set up of PCARRD. This reorganization plan was submitted to the Board of Regents and approved under BOR resolution No. 285, S. 1981 in its 108th meeting. In May 1980-81 the School of Marine Fisheries and Technology was established. This was a tertiary level joint project of the MSU-College of Fisheries and the MSU-IFRD. The MSU Board of Regents gave its seal of approval to this venture by passing BOR Resolution No. 2190, S. 1980. The School serves as the academic arm of IFRD. SMFT students have access to the laboratory facilities of IFRD and have the institute researchers as instructors. The students of the school are therefore assured not only of a strong theoretical foundation of their tasks, but are also assured of the required expertise in the application of their career in the field of fisheries. This was the assessment of a study team composed of professors from the UP College of Fisheries at Diliman, and of representatives from the Ministry of Education, Culture, and Sports (MECS) when they toured the IFRD Campus in 1985 and 1986. The group recommended that IFRD be designated as the center for Marine Sciences in Mindanao. SMFT is headed by a dean and it offers courses along its specialization; Bachelor of Science in Marine Biology, Bachelor of Science in Fisheries Major in Mariculture, Diploma in Fisheries Technology major in Fish Culture Technology and Fish Processing Technology, and a graduate program in Marine Biology. By 1981, the Institute was restructured pursuant to BOR Resolution 285 Series of 1981. In 1982 Naawan Fisheries High School was integrated with the Institute pursuant to BOR Resolution 174, Series of 1982. In 1988 MSU Naawan was formally organized as a distinct autonomous unit of the MSU System pursuant to Memorandum Orders No. 3 and no. 45 and BOR resolution 92, Series of 1988. On July 21, 1988, the first Executive Director for the Naawan campus was elected by the Board of Regents of the University. By August 5, after two weeks of dialogic consultations with the campus constituents, the Executive Director completed the revamp of the second and lower level leadership positions of the campus in accordance with its BOR approved new-organizational structure. This was immediately followed by reorientation meetings with the new set of officials where the objectives of the university and the programs to be specifically pursued and charted with mandated objectives towards, research, extension, and instruction. Right now, MSU Naawan is headed by a Chancellor. The organization thrives on a simplified organizational structure where six deans, a principal and three administrative heads including a special project manager report directly to her. Seven of these light middle management positions are mere designations utilizing the faculty without additional compensation.